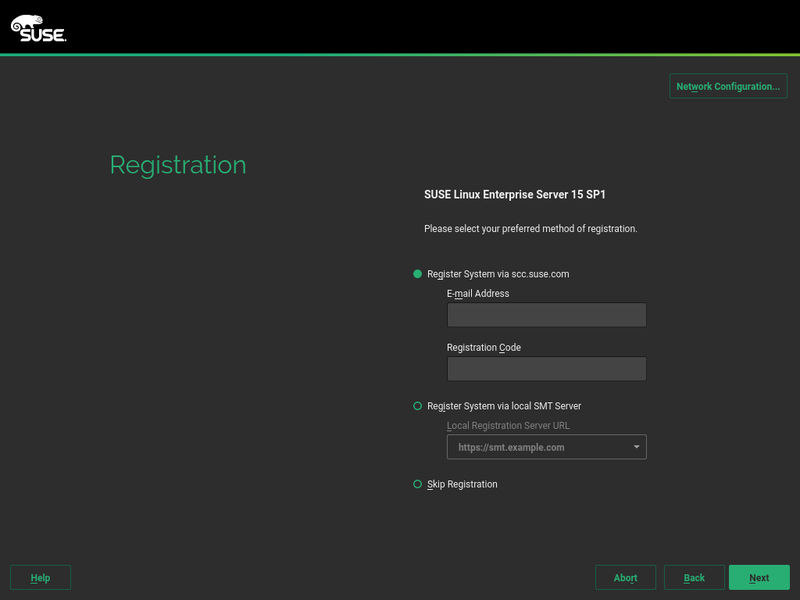 This Quick Start guides you step-by-step through the installation of SUSE® Linux Enterprise Server 15. Starting with SUSE Linux Enterprise Server 15, the installation medium only consists of the Installer, a minimal, command line-based system for installing, updating and registering SUSE Linux Enterprise Server. During the installation you can add functionality by selecting modules to be installed on top of the Installer. A default installation requires network access to either contact the SUSE Customer Center or a local Repository Mirroring Tool server to retrieve repository data for the modules. In case you want to perform an installation without network access, a second installation medium, the SLE-15-Packages ISO image, is required. 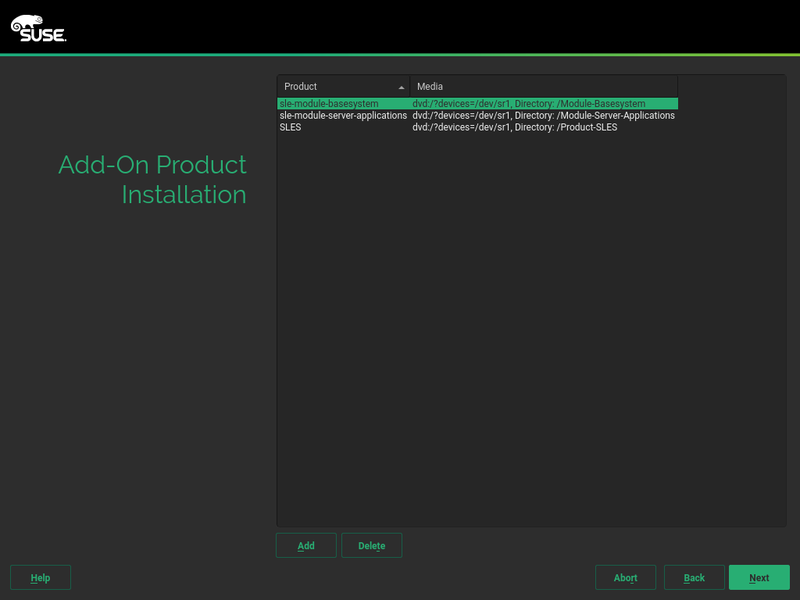 To install SUSE Linux Enterprise Server, boot or IPL into the installer from the Installer medium and start the installation. The Language and Keyboard Layout settings are initialized with the language you chose on the boot screen. If you did not change the default, it will be English (US). Change the settings here, if necessary. Use the Keyboard Test text box to test the layout. Select a product for installation. You need to have a registration code for the respective product. In the course of this document it is assumed you have chosen SUSE Linux Enterprise Server. Proceed with Next. Read the License Agreement. It is presented in the language you have chosen on the boot screen. Translations are available via the License Language drop-down box. 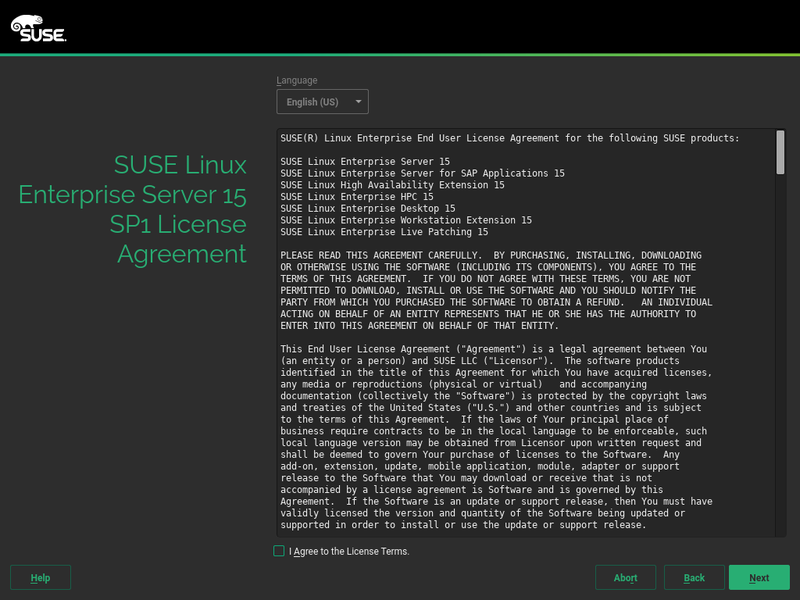 You need to accept the agreement by checking I Agree to the License Terms to install SUSE Linux Enterprise Server. Proceed with Next. A system analysis is performed, where the installer probes for storage devices, and tries to find other installed systems. If the network was automatically configured via DHCP during the start of the installation, you will be taken to the registration step. If the network is not yet configured, the Network Settings dialog opens. Choose a network interface from the list and configure it with Edit. Alternatively, Add an interface manually. See Book “Deployment Guide”, Chapter 8 “Installation Steps”, Section 8.6 “Network Settings” and Book “Administration Guide”, Chapter 17 “Basic Networking”, Section 17.4 “Configuring a Network Connection with YaST” for more information. If you prefer to do an installation without network access, skip this step without making any changes and proceed with Next. Skip this step if you are not installing on IBM Z hardware. Configure the attached hard disks. Select DASD, Fibre Channel Attached SCSI Disks (zFCP), or iSCSI for the installation of SUSE Linux Enterprise Server. The DASD and zFCP configuration buttons are only available if the corresponding devices are attached. Proceed with Next to set up the selected disk type. 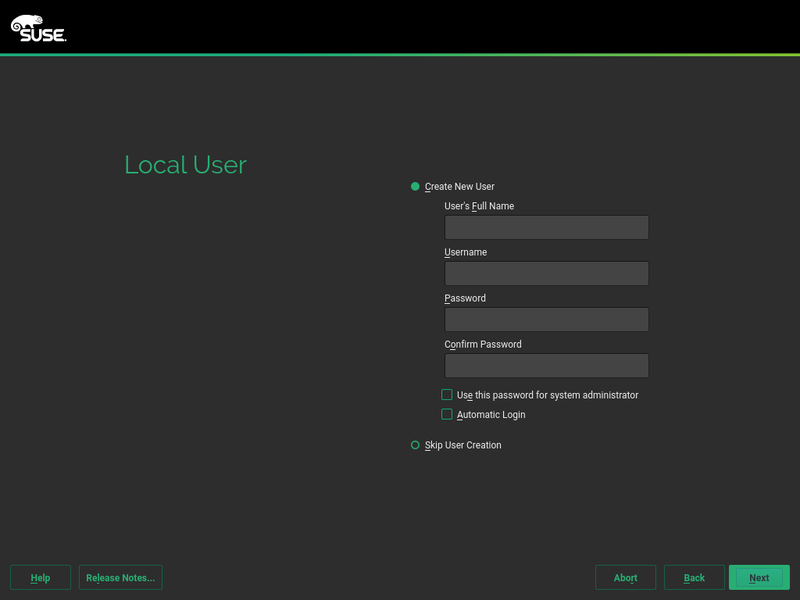 To get technical support and product updates, you need to register and activate your product with the SUSE Customer Center or a local registration server. 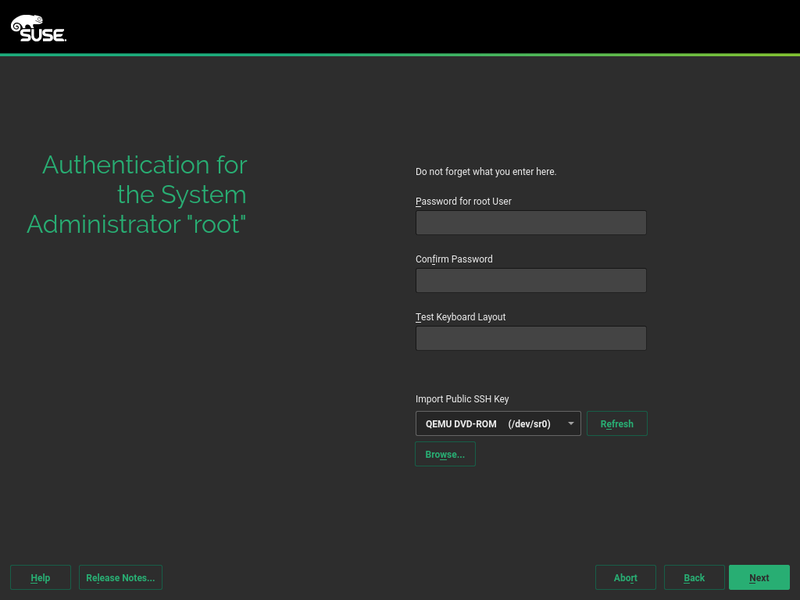 Registering SUSE Linux Enterprise Server at this stage also grants you immediate access to the update repository. This enables you to install the system with the latest updates and patches available. When registering, repositories and dependencies for the modules and extensions, which you may install with the next step, are loaded from the registration server. If you are offline or want to skip registration, activate Skip Registration. Proceed with the installation by following the instructions in Section 1.2, “Installing without Registration”. 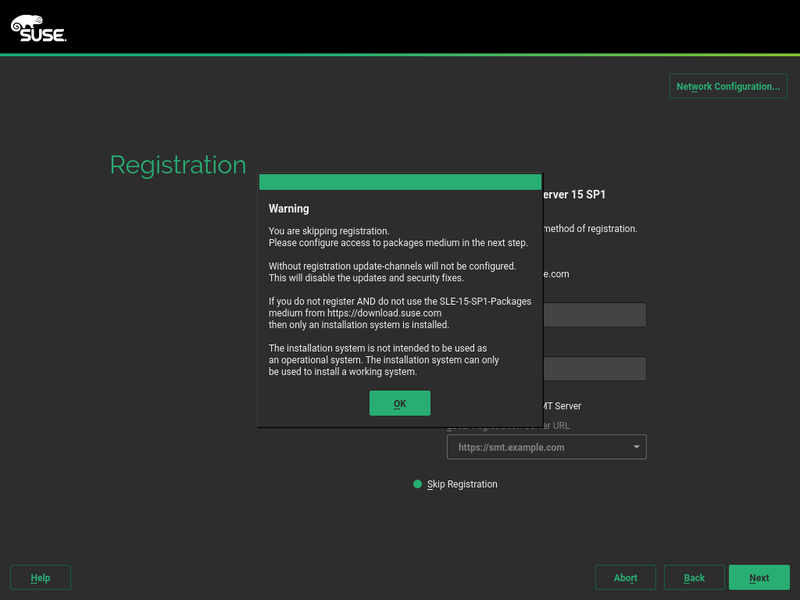 To register with the SUSE Customer Center, enter the E-mail Address associated with your SCC account and the Registration Code for SUSE Linux Enterprise Server. If your organization provides a local registration server, you may alternatively register there. Activate Register System via local SMT Server and either choose a URL from the drop-down box or type in an address. After SUSE Linux Enterprise Server has been successfully registered, you are asked whether to install the latest available online updates during the installation. If choosing Yes, the system will be installed with the most current packages without having to apply the updates after installation. Activating this option is recommended. 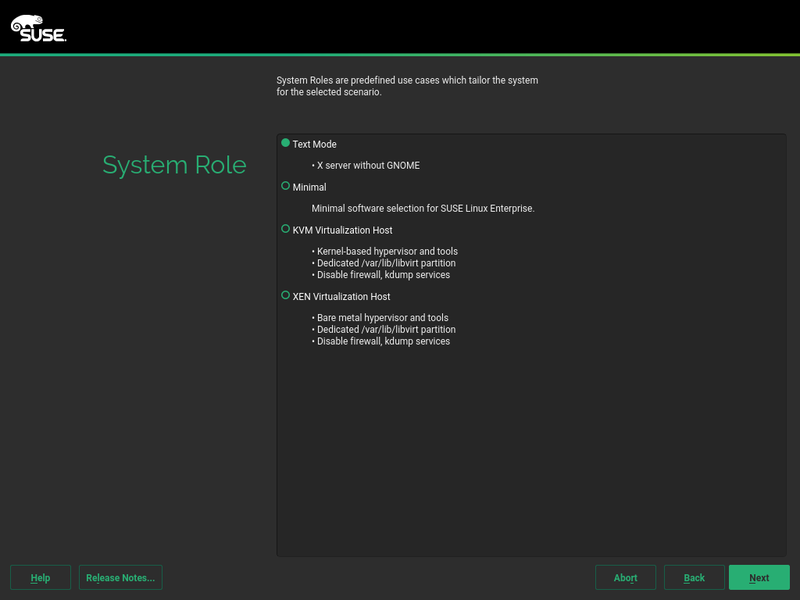 After the system is successfully registered, the installer lists modules and extensions that are available for SUSE Linux Enterprise Server. Modules are components which allow you to shape the product according to your needs. They are free of charge. Extensions add functionality to your product. They are offered as subscriptions and require a registration key that is liable for costs. The availability of certain modules or extensions depends on the product you have chosen in the first step of this installation. For a description of the modules and their lifecycles, select a module to see the accompanying text. More detailed information is available in the Modules & Extensions Quick Start and the Release Notes. The selection of modules indirectly affects the scope of the installation, because it defines which software sources (repositories) are available for installation and in the running system. This module adds a basic system on top of the Installer. It is required by all other modules and extensions. The scope of an installation that only contains the base system is comparable to the installation pattern minimal system of previous SUSE Linux Enterprise Server versions. This module is selected for installation by default and should not be deselected. Contains support and tools for containers. Adds a graphical user interface and essential desktop applications to the system. Contains compilers (including gcc) and libraries required for compiling and debugging applications. Replaces the former Software Development Kit (SDK). Contains packages that were available in previous versions of SUSE Linux Enterprise Server, but have been discontinued in SLES 15. This module is recommended when migrating from a previous product version. Contains all tools required to create images for deploying SUSE Linux Enterprise Server in cloud environments such as the Amazon Web Services (AWS), Microsoft Azure, Google Compute Platform, or the SUSE OpenStack Cloud. Adds server functionality by providing network services such as DHCP server, name server, or Web server. This module is selected for installation by default; deselcting it is not recommended. 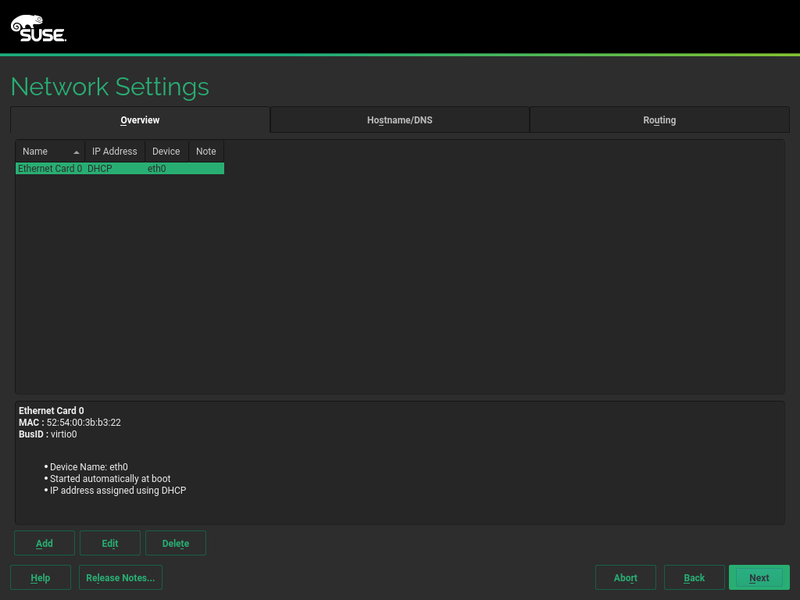 Adds tools allowing you to interact with a SUSE Cloud Application Platform product. Provides access to packages for SUSE Linux Enterprise Server maintained by the openSUSE community. These packages are delivered without L3 support and do not interfere with the supportability of SUSE Linux Enterprise Server. For more information refer to https://packagehub.suse.com/. Contains packages intended for a running Web server. Adds support for distributed storage with Ceph to SUSE Linux Enterprise Server. Requires a separate license key. Adds clustering support for mission critical setups to SUSE Linux Enterprise Server. This extension requires a separate license key. Adds support for performing critical patching without having to shut down the system. This extension requires a separate license key. 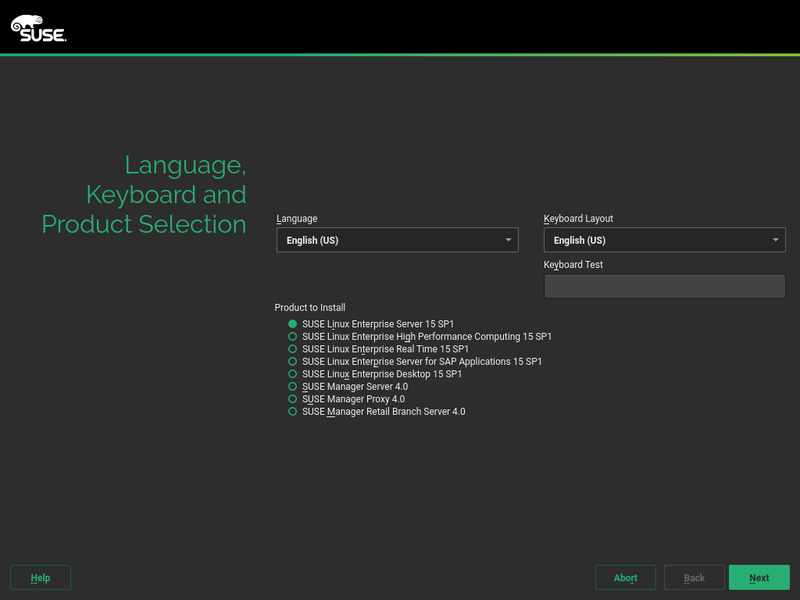 Extends the functionality of SUSE Linux Enterprise Server with packages from SUSE Linux Enterprise Desktop, like additional desktop applications (office suite, email client, graphical editor, etc.) and libraries. It allows to combine both products to create a fully featured workstation. This extension requires a separate license key. Some modules depend on the installation of other modules. Therefore, when selecting a module, other modules may be selected automatically to fulfill dependencies. Depending on the product, the registration server can mark modules and extensions as recommended. Recommended modules and extensions are preselected for registration and installation. To avoid installing these recommendations, deselect them manually. Select the modules and extension you would like to install and proceed with Next. In case you have chosen one or more extensions, you will be prompted to provide the respective registration codes. Depending on your choice, it may also be necessary to accept additional license agreements. 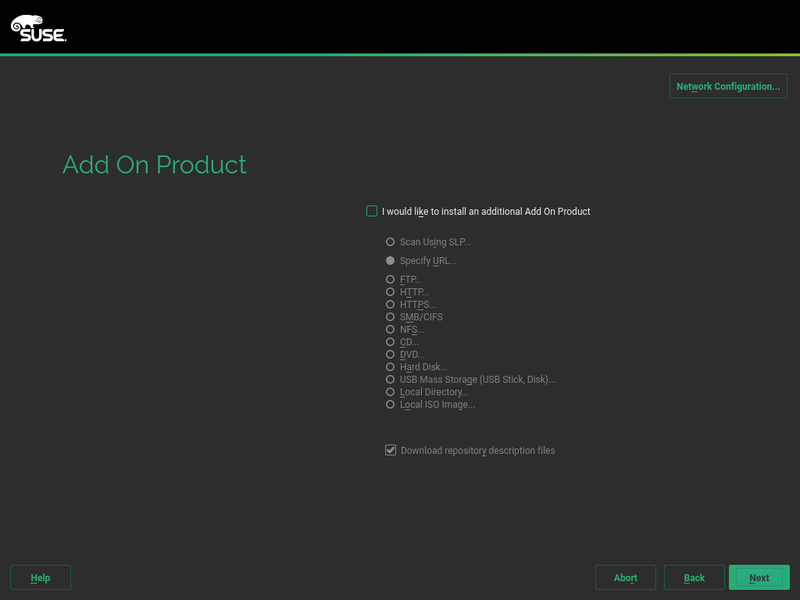 The Add-On Product dialog allows you to add additional software sources (so-called “repositories”) to SUSE Linux Enterprise Server, that are not provided by the SUSE Customer Center. Such add-on products may include third-party products and drivers or additional software for your system. You can also add driver update repositories via the Add-On Product dialog. 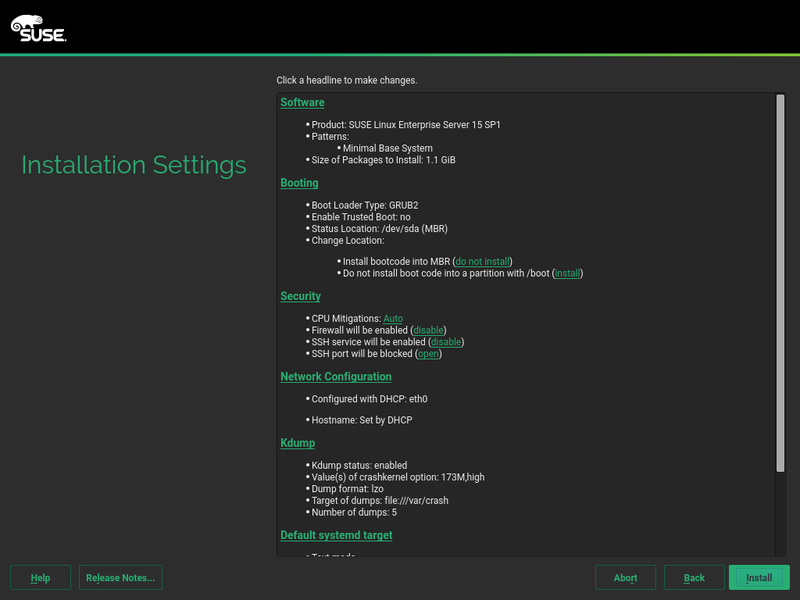 Driver updates for SUSE Linux Enterprise are provided at http://drivers.suse.com/. These drivers have been created via the SUSE SolidDriver Program. If you want to skip this step, proceed with Next. Otherwise activate I would like to Install an Add-on Product. Specify a media type, a local path, or a network resource hosting the repository and follow the on-screen instructions. Check Download Repository Description Files to download the files describing the repository now. If deactivated, they will be downloaded after the installation has started. Proceed with Next and insert a medium if required. Depending on the product's content it may be necessary to accept additional license agreements. Proceed with Next. If you have chosen an add-on product requiring a registration key, you will be asked to enter it before proceeding to the next step. The availability of system roles depends on your selection of modules and extensions. System roles define, for example, the partitioning proposal and the set of software patterns that is going to be preselected for the installation. Refer to the description on screen to make your choice. Select a role and proceed with Next. From this point on, the Release Notes can be viewed from any screen during the installation process by selecting Release Notes. Starts a wizard which lets you refine the partitioning proposal. Options available here depend on your system setup. In case it contains more than a single hard disk, you may choose which disk(s) to use and where to place the root partition. If the disk(s) already contain partitions, decide whether to remove or resize them. In subsequent steps you may also add LVM support and disk encryption. You can change the file system for the root partition and decide whether to have a separate home partition or not. Opens the Expert Partitioner described in Book “Deployment Guide”, Chapter 10 “Expert Partitioner”, Section 10.1 “Using the Expert Partitioner”. This gives you full control over the partitioning setup and lets you create a custom setup. This option is intended for experts. To accept the proposed setup without any changes, choose Next to proceed. 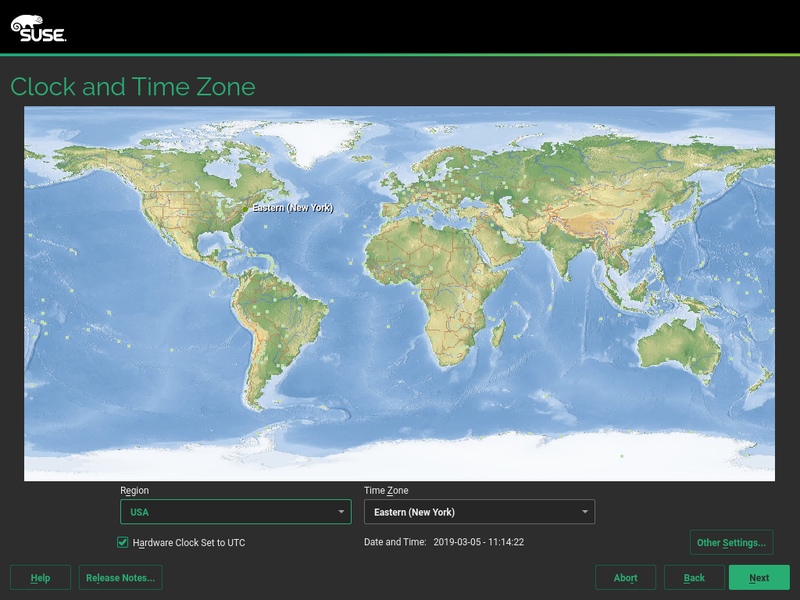 Select the clock and time zone to use in your system. To manually adjust the time or to configure an NTP server for time synchronization, choose Other Settings. See Book “Deployment Guide”, Chapter 8 “Installation Steps”, Section 8.12 “Clock and Time Zone” for detailed information. Proceed with Next. To create a local user, type the first and last name in the User’s Full Name field, the login name in the Username field, and the password in the Password field. The password should be at least eight characters long and should contain both uppercase and lowercase letters and numbers. The maximum length for passwords is 72 characters, and passwords are case-sensitive. For security reasons it is also strongly recommended not to enable the Automatic Login. You should also not Use this Password for the System Administrator but rather provide a separate root password in the next installation step. If you install on a system where a previous Linux installation was found, you may Import User Data from a Previous Installation. Click Choose User for a list of available user accounts. Select one or more user. In an environment where users are centrally managed (for example by NIS or LDAP) you may want to skip the creation of local users. Select Skip User Creation in this case. Type a password for the system administrator account (called the root user). You should never forget the root password! After you entered it here, the password cannot be retrieved. See Book “Deployment Guide”, Chapter 8 “Installation Steps”, Section 8.14 “Password for the System Administrator” for more information. Proceed with Next. It is recommended to only use characters that are available on an English keyboard. In case of a system error or when you need to start your system in rescue mode a localized keyboard might not be available. Use the Installation Settings screen to review and—if necessary—change several proposed installation settings. The current configuration is listed for each setting. To change it, click the headline. Some settings, such as firewall or SSH can directly be changed by clicking the respective links. Changes you can make here, can also be made later at any time from the installed system. However, if you need remote access directly after the installation, you should check the Firewall and SSH settings. The scope of the installation is defined by the modules and extensions you have chosen for this installation. However, depending on your selection, not all packages available in a module are selected for installation. Clicking Software opens the Software Selection and System Tasks screen, where you can change the software selection by selecting or deselecting patterns. Each pattern contains several software packages needed for specific functions (for example, KVM Host Server). For a more detailed selection based on software packages to install, select Details to switch to the YaST Software Manager. See Book “Deployment Guide”, Chapter 17 “Installing or Removing Software” for more information. This section shows the boot loader configuration. Changing the defaults is only recommended if really needed. Refer to Book “Administration Guide”, Chapter 12 “The Boot Loader GRUB 2” for details. By default, the Firewall is enabled with all network interfaces configured for the public zone. See Book “Security Guide”, Chapter 16 “Masquerading and Firewalls”, Section 16.4 “firewalld” for configuration details. The SSH service is enabled by default, its port (22) is open. Click enable and open to toggle these settings. Note that if SSH is disabled, logging in from remote will not be possible. Kdump saves the memory image (“core dump”) to the file system in case the kernel crashes. This enables you to find the cause of the crash by debugging the dump file. Kdump is preconfigured and enabled by default. See Book “System Analysis and Tuning Guide”, Chapter 17 “Kexec and Kdump”, Section 17.7 “Basic Kdump Configuration” for more information. In case you have installed the desktop applications module, the system boots into the graphical target, with network, multiuser and display manager support. Switch to multi-user if you do not need to log in via display manager. View detailed hardware information by clicking System. In the resulting screen you can also change Kernel Settings—see Book “Deployment Guide”, Chapter 8 “Installation Steps”, Section 8.15.8 “System” for more information. After you have finalized the system configuration on the Installation Settings screen, click Install. Depending on your software selection you may need to agree to license agreements before the installation confirmation screen pops up. Up to this point no changes have been made to your system. After you click Install a second time, the installation process starts. During the installation, the progress is shown in detail on the Details tab. The SUSE Linux Enterprise Server Release Notes tab shows important information; reading them is recommended. After the installation routine has finished, the computer is rebooted into the installed system. Log in and start YaST to fine-tune the system. If you are not using a graphical desktop or are working from remote, refer to Book “Administration Guide”, Chapter 5 “YaST in Text Mode” for information on using YaST from a terminal. If you perform an installation without connecting to a registration server, you cannot register your system during the installation. Therefore you will not be able to receive the repository configuration for modules and extensions from the registration server. To enable a regular installation, SUSE offers a second installation medium, the SLE-15-Packages ISO image. Your system and extensions need to be registered in order to retrieve updates and to be eligible for support. If you do not register during the installation, you can do so at any time later from the running system. To do so, run YaST › Product Registration. To perform the installation without registration, make sure the contents of the SLE-15-Packages ISO image can be accessed during the installation. This can be achieved by copying it to a local hard disk or a removable flash disk, by burning the image to a DVD, or by making it available in the local network. Choose a method that is supported by your hardware. To copy the contents of an ISO image to a removable flash disk, use the following command. root # fdisk -l /dev/sdc | grep -e "^/dev"
Make sure a partition with sufficient size (6 GB or more) exists on the device. It also must not be mounted when running the dd command. Note that all data on the partition will be erased! The installation follows the same workflow as outlined in Section 1.1, “The Default Installation Procedure”, only the steps for registering the system and adding modules/extensions differ. To start the installation, perform the steps Section 1.1.1, “Language, Keyboard, and Product Selection” to Section 1.1.4, “IBM Z: Disk Activation” from Section 1.1, “The Default Installation Procedure”. On the Registration screen activate Skip Registration. Accept the warning with OK and proceed with Next. On the Add On Product dialog, activate I would like to install an additional Add On Product and specify the source for the SLE-15-Packages ISO image. Check Download repository description files to download the files describing the repository now. If deactivated, they will be downloaded after the installation starts. Proceed with Next. If you chose DVD as the data source, you will be prompted to insert the media. 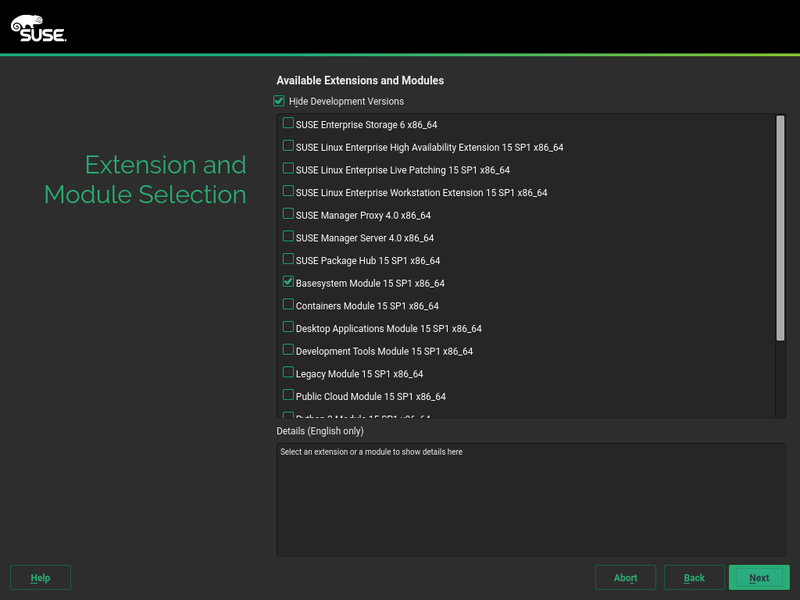 On the Extension and Module Selection dialog you need to select a product, at least one module, and optionally, one or more extensions. The SLE-15-Packages ISO images contains extensions and modules for all SUSE Linux Enterprise products. 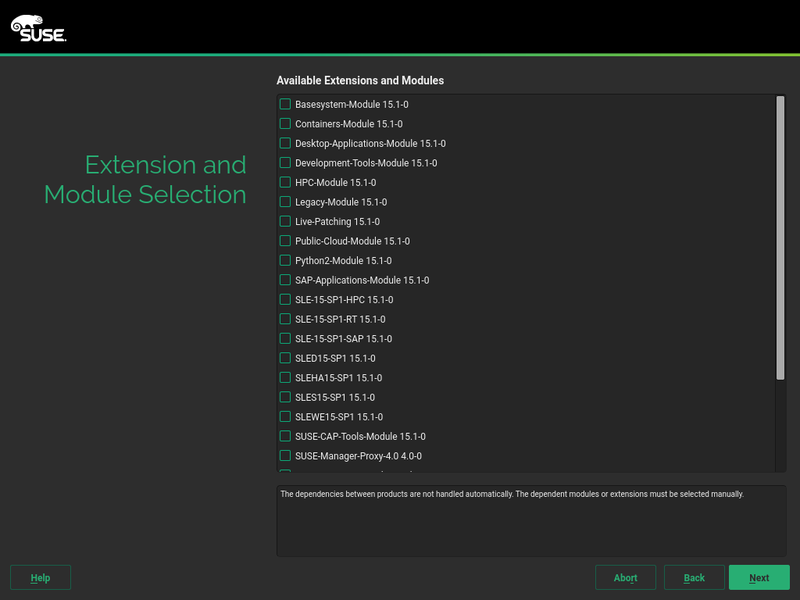 Make sure to only select modules and extensions listed below, otherwise you will end up with a system that may fail to install and is not covered by SUSE support. Selecting a product is mandatory. Choose SLES 15 15-0. Modules extend the functionality of SUSE Linux Enterprise Server and are free of charge. Installing the Basesystem-Module 15-0 is required. It is also recommended to install the Server-Applications-Module 15-0. Note that most modules depend on other modules. These dependencies cannot be resolved automatically here. Make sure to manually solve the dependencies, otherwise the installation will fail later on. Refer to the following list for details. Development-Tools-Module 15-0. Contains compilers (including gcc) and libraries required for compiling and debugging applications. Choosing an extension is optional. Extensions add further core functionality to SUSE Linux Enterprise Server and require a registration code which is liable for costs. Note that extensions depend on modules. These dependencies cannot be resolved automatically here. Make sure to manually solve the dependencies, otherwise the installation will fail later on. Refer to the following list for details. Do not install any of the following selections on SUSE Linux Enterprise Server, otherwise you will end up with a system that may fail to install and is not covered by SUSE support. When you have finished selecting modules and extensions, proceed with Next. All modules selected for installation are listed on the Add-On Product Installation dialog. To change the list, use the Add or Delete options. Using Add you may optionally add other add-on products. Proceed with the installation with Next. From this point on, the installation follows the same path as the default installation. Proceed with the step>Section 1.1.8, “System Role” from Section 1.1, “The Default Installation Procedure”. Copyright© 2006– 2019 SUSE LLC and contributors. All rights reserved. All information found in this book has been compiled with utmost attention to detail. However, this does not guarantee complete accuracy. Neither SUSE LLC, its affiliates, the authors, nor the translators shall be held liable for possible errors or the consequences thereof. Copyright (C) 2000, 2001, 2002 Free Software Foundation, Inc. 51 Franklin St, Fifth Floor, Boston, MA 02110-1301 USA. Everyone is permitted to copy and distribute verbatim copies of this license document, but changing it is not allowed. The purpose of this License is to make a manual, textbook, or other functional and useful document "free" in the sense of freedom: to assure everyone the effective freedom to copy and redistribute it, with or without modifying it, either commercially or non-commercially. Secondarily, this License preserves for the author and publisher a way to get credit for their work, while not being considered responsible for modifications made by others. We have designed this License to use it for manuals for free software, because free software needs free documentation: a free program should come with manuals providing the same freedoms that the software does. But this License is not limited to software manuals; it can be used for any textual work, regardless of subject matter or whether it is published as a printed book. We recommend this License principally for works whose purpose is instruction or reference. You may copy and distribute the Document in any medium, either commercially or non-commercially, provided that this License, the copyright notices, and the license notice saying this License applies to the Document are reproduced in all copies, and that you add no other conditions whatsoever to those of this License. You may not use technical measures to obstruct or control the reading or further copying of the copies you make or distribute. However, you may accept compensation in exchange for copies. If you distribute a large enough number of copies you must also follow the conditions in section 3.